Happy Deepavali to all my readers! We are starting the Blogging Marathon # 34. I am starting with Evening Snacks/ Tiffin. Naturally I will be focusing it on Kid’s food. 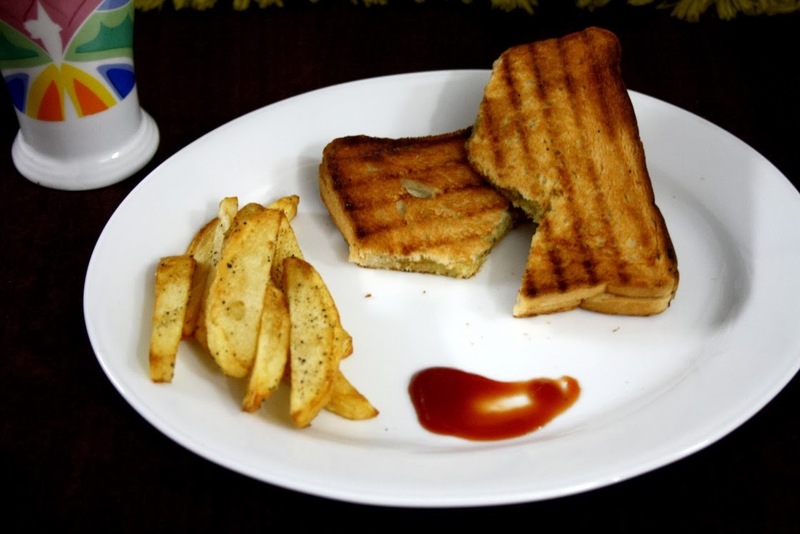 The dishes that one can put under Evening Snacks/ Tiffins can be anything sandwich or a light meal as well. It all depends on how you manage the meal. It can be a high tea as well, with trays of cookies with milk or whatever else your kid loves. 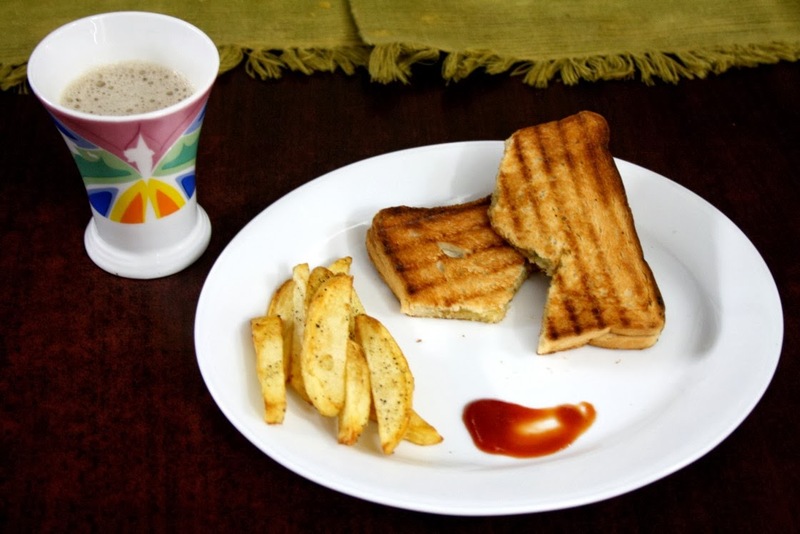 With kids at home, one is always challenged for ideas on what to serve them for breakfast, school snacks or be it evening snacks. My boys are quite picky and I am so glad that Konda has progressed a bit on the selection, she eats something more than what she used to eat as a five year old. And moreover she used to eat something in the morning before school. However my boys hardly drink their milk. So I pack some tiffin for their snack break. And lately I see that they bring it back, saying their friends bring snack items for their break. I have no choice but to resort sending biscuits, fruits. Unless I bake cookies or some other snack dishes, it mostly it ends up being biscuits. This makes it very important that we need something substantial when they get back home. So they have their rice. I know it’s odd time, but can’t help it as its the only time they eat rice. And that too something solid. I know we Indians have a different view on what food falls under solid food and if it’s not rice, it is not solid. On the other hand, Konda sometime manages to eat rice for her lunch, so in those days her evening food when she comes back home makes up as Sandwiches and other light tiffin that she loves. I had this chili cheese grilled sandwich with chedder cheese and added chillies. It was really so delicious. To make it even more interesting I paired it with potato wedges. Grease the bread slices with butter. 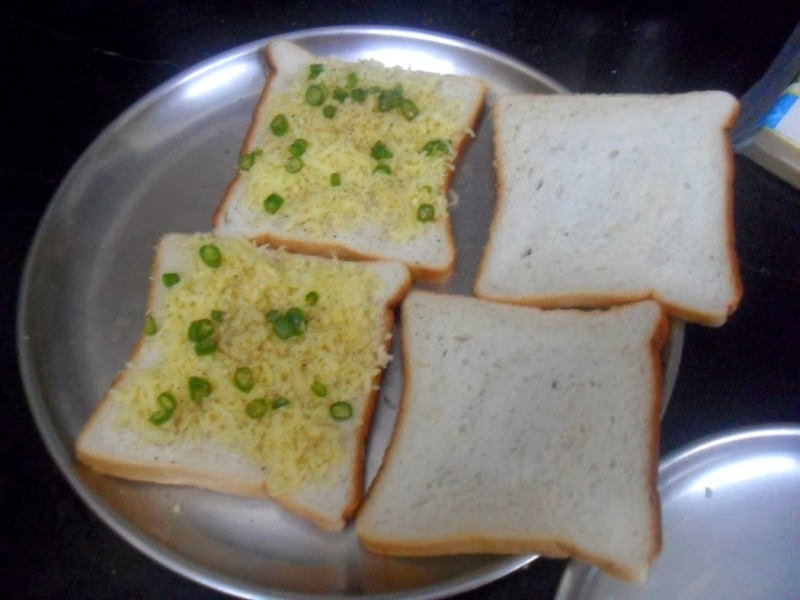 Top the slices with grated chedder cheese, finely chopped green chilies, sprinkle pepper powder. Cover with the other bread slices. Heat the Grill maker. Once the red light changes, press the top over and close tightly. Cook till the light changes. Cut the sandwich in fancy shapes to make it attractive to kids. 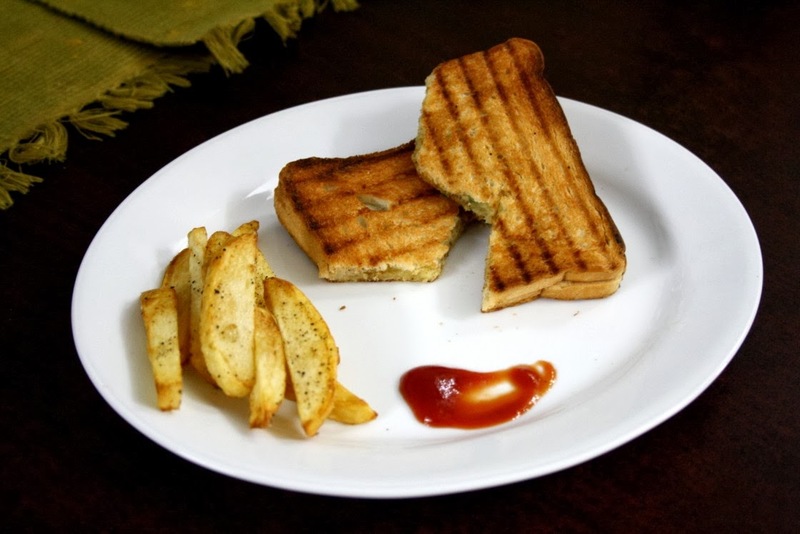 Serving this during evening makes it idle time for you to include some starch and make it more interesting, by serving with potato wedges. Chili n cheese, awesome combo!!! Looks very inviting!!! Perfect snack for lunch box. Loved it. That could be my evening snack! Very yummy.. Very tempting sandwich.. This could make a satisfying snack for me too.. Incredible and terrific dish,cant resist. Getting the kids to eat snacks and lunch at school is such a hurdle. I too make her eat rice after school! Even I like this cheese and chilli sandwich. perfect snack for me. 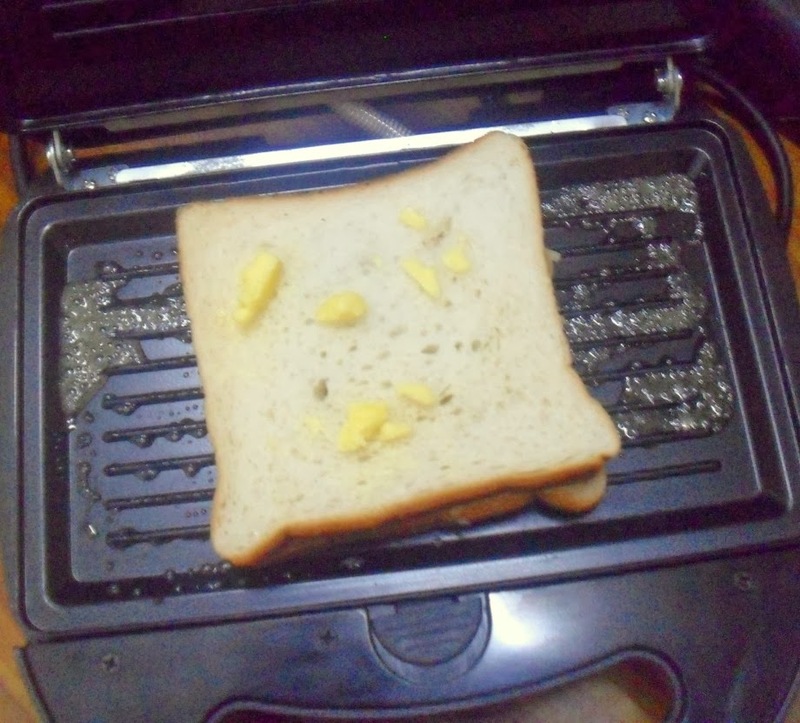 Ooooh yumm.. that chili cheese sandwich looks spicy and delicious. Chilli cheese sandwich looks wonderful !! Ohh this looks so tempting..Perfect for snack time..